A little over a year after I started to really get into country music and I finally attended my first country gig. Actually better make that 4, well, 3 and a bit – but more on that later. I booked tickets for the inaugural Country To Country music festival back before Christmas, and having to decide between the Saturday or the Sunday, it was Brantley Gilbert and Carrie Underwood that gave Sunday the nod. So fast forward a few months again to the present and with my cowboy hat and boots proudly worn, off the The O2 I went. Apart from 4 main acts playing in the arena each day there were also pop up stages around The O2 with UK country artists playing, and also a market type affair with food and merchandise vendors. Within a few hundred square feet I could have bought a gun, saddle and a portion of goat curry. I chose neither, and didn’t even manage to acquire a free copy of Maverick magazine. Before the music in the arena kicked off with Brantley Gilbert we decided to eat at Frankie and Bennys – big mistake. To say the service was slow would be an insult to those catering staff who pride themselves on being genuinely slow. We waited an hour and ten minutes for our main course and to make use of that time we had to order the same round of drinks twice, almost three times, and asked more times than I can remember for a new set of cutlery. It was an agonising combination of the food taking an age and the staff making Fawlty Towers’ Manuel look like a Michelin Star waiter. The food wasn’t bad when it finally came, though the chips, or fries if you prefer, were cold on delivery. Even before any of the acts came on we were treated to Whispering Bob Harris welcoming us and it was his job to introduce each act from then on. Bob Harris is the voice of country music in the UK and presents a country music show on a Thursday on BBC Radio 2 from 7-8pm. It was only right having Bob there and nobody else could have filled that role with the same legitimacy. This guy was the main reason I was going to Country To Country, as his brand of self described southern rock appealed to me, being a huge fan of rock music for the past 3 decades. I think country is really more of an attitude than a sound these days and probably always has been, so he may be unnecessarily downplaying the country on his resume. While Brantley’s second album is a lot rockier than his debut, they take it up another notch or twelve when playing live. Make no mistake, Brantley and his band are a full on country rock band who even tease the boundary to country metal, should such a sub-genre even exist. The sound set-up wasn’t perfect and it came over too loud at times, but not enough to spoil a very energetic and well received performance. It was great to finally see songs like Country Must Be Country Wide, Kick It in the Sticks and You Don’t Know Her Like I Do performed live that I’d come to like so much from playing the CDs. Such was my appreciation that I went straight to the merchandise booth after the set had finished and bought a Brantley Gilbert Hell on Wheels Tour 2013 t-shirt. That’ll be perfect for Country To Country 2014. I’ll hold my hand up and admit that aside from Can’t Fight the Moonlight, I wasn’t sure I knew or liked a great deal of LeAnn’s music, and a few songs into her set I wondered if it night be nice, but just a little dull. However, as if hearing my thoughts, she kicked it up a gear and from then on we got a LeAnn who opened her heart, bore her soul and gave some of the best vocal performances that I have ever had the pleasure to witness. LeAnn seemed genuinely touched at the fantastic response to her music and at one point, after playing a song particularly close to her heart, was moved to tears, briefly. She of course played the songs we all knew, which upon hearing them was many more than just that song from Coyote Ugly as I had previously feared. She even threw in some Janice Joplin and showcased her new single Spitfire. The aforementioned latest single and other new songs she played were really very good, to the point where I’ll be buying her new album when it comes out next month. Don’t think amazing vocals, likable personality and humble nature was all we got though, oh no. To finish her performance at Country To Country, LeAnn Rimes dismissed her band and closed her set with an absolutely spectacular acapella rendition of Amazing Grace. A song so perfect in it’s execution that it made every hair on my neck stand to attention and resulted in a very well deserved standing ovation from the crowd. In just 60 minutes I was turned from being pretty ignorant to LeAnn’s music to a big fan. In fact, I think I’d even go as far as saying that last song was possibly the single greatest vocal performance I have ever heard live. It’s actually been uploaded by someone on YouTube, though the start is missing unfortunately. As great as it sounds on YouTube, it doesn’t do the remarkable performance justice, but it’s something. One of the friends I met up with is a huge Hootie and the Blowfish fan, but I only know Darius from his country music career of the last few years, and especially his 2010 single Come Back Song. I’ve never seen much of him, aside from an appearance on the Lady Antebellum – Own The Night World Tour DVD & Blu-ray, so I wasn’t sure what to expect. What I did get is arguably the performance of the night as Darius is both a great a singer and a fantastic entertainer who has nice guy written all over him, apart from on his very cool Avengers t-shirt. There was one song in particular, It Won’t Be Like This for Long, which he said was written about his kids and aside from being a really great song, every single word resonated with my wife and I, as we watched in awe of his performance and how much the song meant to us. If you are a parent then listen to this song, I guarantee you’ll think it was written just for you. He threw in a couple of Hootie songs, much to the delight my friend, and even a brilliant cover of The Joker, originally by Steve Miller. Darius Rucker is a man leading a band on the road, and his band are awesome. Such a mix of talented musicians, all of whom Darius likes to make as a big part of the show as possible, in spite of it being is name in lights. I came away from this gig a huge Darius Rucker fan, and not just because he finished off with Prince hit Purple Rain. Yes, you read that right. This is where the story starts to go wrong, unfortunately so. Carrie is one of the first country artists I listened to and so apart from being a damn fine singer, has a special place in my heart. However, something went awry with the sound, which I later found out affected some people and not others, depending on where you were sat. From where we were sitting her mic and the lead guitar were set up way way too loud, and I’ve seen Iron Maiden perform at The O2 – they were like choirboys compared to this. It wasn’t just loud, it was very trebly and the sound we ended up getting was, and not to mince my words, painful. We gave it six songs, during which we said we’ll give it one more song each time, as people from all over started to leave. It really did become unbearable, and much to our disappointment we had to leave too. We were not alone as dozens of people were leaving at the same time, all complaining about the sound. Apparently, though not to the same extent, this happened on the previous night with Tim McGraw, so something was obviously very wrong with the changes to the set-up they made for the headliner each night. It would have been to great see Carrie’s whole performance, but if we’d have stayed any longer I may have ended up associating the awful sound engineering with Carrie’s music, and I didn’t want that. In spite of the debacle during Carrie Underwood’s set I thoroughly enjoyed Country To Country. I saw 3 great acts perform live and enjoyed being in a friendly atmosphere of country music fans. Rumours are starting to spread that Country To Country will be returning in 2014. This time I want to attend for both days and I hope the sound is sorted by then too. 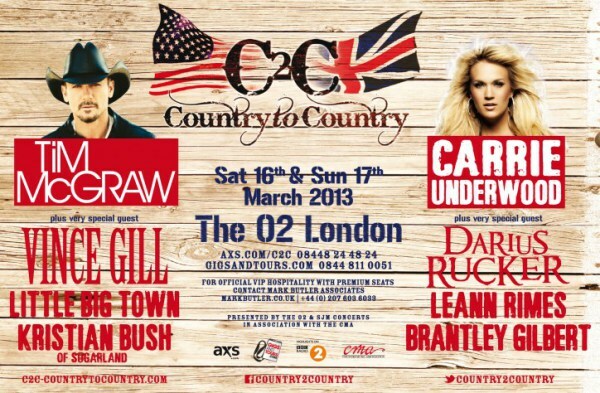 A fantastic first outing for Country To Country and the start of more country music in the UK, I hope.